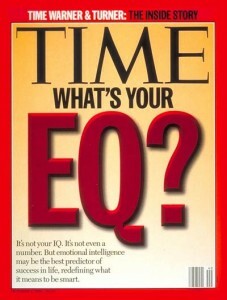 So what’s all this talk I hear about Emotional Intelligence? Emotional Intelligence can be defined as a person’s ability to effectively negotiate social relationships and environments. Emotional Intelligence is a relatively new science and is becoming an important factor in determining a persons success in business and in life. A recent survey of over 2200 hiring managers showed that the majority of managers would select a person with high Emotional Intelligence and a moderate IQ level over a candidate with a high IQ and a moderate level of Emotional Intelligence. What might be interesting to note here is that Emotional Intelligence can be developed in children at a fairly early age. A recent article in Psychology today cited that Emotional intelligence appears to be a key predictor of children’s ability to make suitable peer relationships, get along at home, develop a well-balanced outlook on life, and to reach their academic potential at school. Again … a key predictors of success. Studies show that video games and video game addiction can stunt Emotional Intelligence. So much so that a 21-years old could have the Emotional Intelligence of a 12-year old because they lack the social skills to interact in face-to-face social situations. So What’s Your Level of Emotional Intelligence? There are 100’s of online assessments that vary widely in statistical validity. If you are interested in a statistically valid assessment, email me and we can help you. Regardless of what your Emotional Intelligence score is you can always improve. Unlike other aspects of your self that can be difficult to change, Emotional Intelligence happens to be something you can improve with a little focus and intention. Journal Daily – Recap your day and identify your experience from an emotional state at various times throughout the day. Keep a Log – Identify your emotions and write them in a in a small notepad or enter them in your phone as you go through your day. Pay Attention to Stress Triggers – Pay attention when your emotions are running high or you are shutting down in a situation. Before it goes on for too long, excuse yourself from the situation. Find a place where you can stop and take at least 5 slow deep breaths in through your nose, hold at the top of the inhale for 3-4 second,s and then exhale slowly through your mouth (repeat 5 times) and then return to the situation at hand. Managing your emotions is the key to collaborating, relating, leading, selling, coaching, interacting, communicating, parenting, serving others, volunteering, teaching, mentoring, etc. Your ability to stay centered and calm in what could be an emotionally uncomfortable situation will create more success in your business and your life and after all isn’t that what we all want? PreviousPrevious post:Growth and HappinessNextNext post:Do You Have … True Grit?